Determined to have a real Thanksgiving this year (the thought of cooking a full turkey dinner for three people depressed me), I invited a couple of families to join us. Eagerly I began planning the menu and polishing the silver, and began looking around the home with a critical eye, making mental note of all the cleaning and staging that needed to be done before the “blessed event.” My husband calls it “tornado mode,” and counts his blessings that we don’t entertain more often. Clearly, he was out of practice. Instead of scurrying for his office at the first sign of “Tornado Heidi” and her dust cloth, Craig wasted precious moments wondering aloud if we were having two kinds of pie this year. He was promptly set to work fixing chairs and hanging pictures (after a year in this place, we figured it was time). When I came up for air, I took a closer look at my husband’s handiwork, and noticed that he had arranged old family portraits all around the circumference of the dining room: black-and-white or sepia tone, their solemn faces watching over us as we eat. In the kitchen, a tribute of a different kind is playing out: From my old recipe file, I pull out the recipe cards from four generations of women: My great-grandmother’s rye buns, my grandmother’s pie crust, my favorite aunt’s pistachio fruit salad, my mother’s sweet potato casserole, and my own special corn spoon bread. Sarah launches into her “Rachel Ray” routine, providing a running narrative as a chop, soak, bake, and peel. The aroma of rosemary, sage, and thyme gently competes with the spices for the pumpkin pie. The Christmas morning scene from Little Women, in which the March girls gladly give up their precious sausages for the poor family down the street, completes the tableau. There is still so much work to do . . . and yet, at that moment I stop and take it all in. So much of our lives has become running from one event to the next. It felt good to hit the “pause” button long enough to drink it all in, and to acknowledge the joy in the preparation. Next week, as we celebrate the final week in the liturgical calendar, Christ the King, we recall that all our lives are similarly ordered toward a great event: the marriage of heaven and earth. This week we remember that the infant “Guest” we welcome every Christmas has become the ultimate Host at the wedding feast of the Lamb. As the anticipation of Advent approaches, let’s be sure to “pause” long enough in our preparations for the Infant to behold the King, and revel in his invitation to join in the feast as true daughters and sons of royalty. 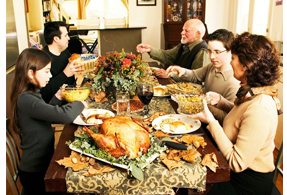 What holiday dish or tradition do you make each year, that says “Thanksgiving” to you? Next Article Why Dads Don’t Talk. And Sons Won’t Listen.